The Syrian Ceasefire: Saviour or a Sham? The UN Secretary General, Kofi Annan, has outlined his peace plans for Syria and has received word from the Syrian Government that it agrees to the peace plans. But has President Assad kept his word? According to the Free Syrian Army Militants, troops from the Syrian Army are still on the streets of cities like Homs, together with tanks and artillery batteries. This was confirmed when journalists from the BBC shot secret footage of Syrian Army tanks still on the streets of rebel-held cities. 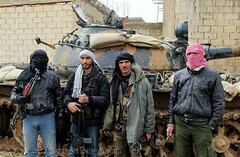 Assad has decreed that the tanks are there purely for security measures and to fight the Free Syrian Army, which the Syrian government has branded ‘Armed Terrorists.’ The Free Syrians say they are fighting for a just cause but have refused to listen to Kofi Annan’s peace plan as they believe that the government will not respect it. For the time being they may be right. The UN have sent monitors to Syria to see that Assad removes all tanks and soldiers from Syrian cities and that a democratic voting process is introduced. It has refused to take any military action, but will issue sanctions on Syria if the ceasefire is not acted upon properly by the Syrian Government. However, the Free Syrians have committed atrocities as well as Assad’s Army. A UN truck was blown up by a Free Syrian bomb in the capital Damascus, wounding the truck’s occupants. The Free Syrians have said that this was simply a mistake, but the government and the UN are wary of the Free Syrians motives. After more bombing was reported in Homs and Damascus, the UN issued a final warning to President Assad and the Free Syrian Army, that if they did not make peace and form a coalition government, more sanctions would be appplied. The UN even threatened to use force to remove the government and install a democratic constitution, but Russia and China have vetoed this, causing outrage throughout the UN General Assembly. Recently, it has been reported that the Syrian Army have been kidnapping children and torturing them to find out if their parents support the Free Syrians, and then tying them to their tanks to use as a human shield. Large-scale massacres in villages have also taken place. This has forced the UN to brand President Assad as a war criminal, even though the country isn’t officially at war! As has been clearly shown, the Syrian ceasefire clearly hasn’t worked and the UN fear that if action is not taken immediately the country will slide into full-scale civil war.